He was out of sight last year, with shoulder surgery wiping away his entire 2018 season. 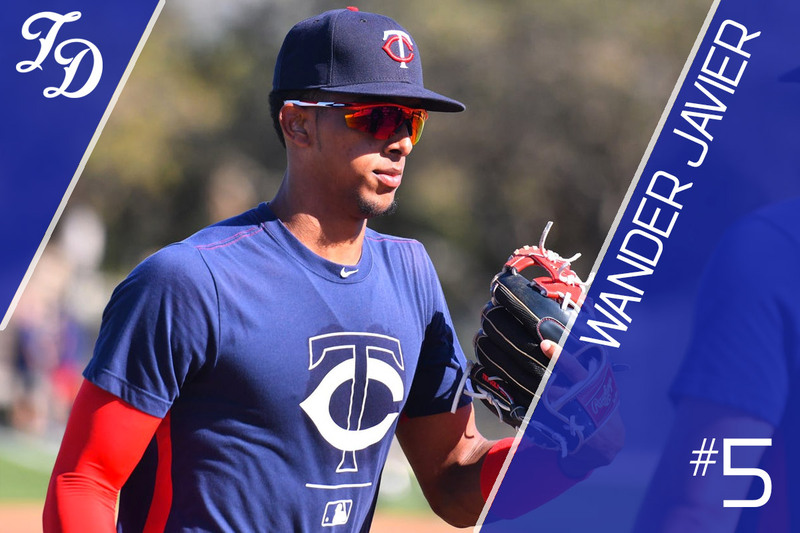 But this uber-talented young shortstop was never out of our minds, and his massive upside as a dynamic two-way talent keeps him near the top of our Twins prospect rankings. Losing major time to injury has, sadly, become a rite of passage for Twins top prospects. Miguel Sano and Alex Kirilloff both missed full seasons after Tommy John surgery. Byron Buxton had nearly his entire 2014 erased by wrist and thumb issues. Fernando Romero was sidelined for two consecutive campaigns by elbow and knee surgeries. Wander Javier is the latest to join this lineage, but there's good news: Each of the prospects above came back after a long absence and almost immediately returned to prior form, if not better. Javier has shown very good form when on the field, but that doesn't amount to much time. Signed at age 16 out of the Dominican Republic for a club-record $4 million, the skinny shortstop's early focus was adding strength and weight. He played in only 50 official pro games before hurting his shoulder in late 2017. The Twins tried to remedy the issue through rehab but that didn't take, and Javier underwent labrum surgery on his left (non-throwing) shoulder last May. The recovery timeline from this procedure was estimated at six-to-nine months, so Javier will be on the other side of it when spring training kicks off, and all reports have him coming in at 100%. When at full strength, the righty-swinging infielder has plenty of offer. Unlike fellow big international splashes Sano and Yunior Severino, who were both technically signed as shortstops out of the Dominican but with the expectation they'd bulk up and move elsewhere, Javier is fully expected to remain at short and be an asset there. He's quick and fluid in his motions, with good mechanics and a strong arm. Projecting as a quality shortstop has plenty of value on its own, but what really makes Javier a special talent is his bat. In two stints at rookie ball, he owns a .301/.386/.497 slash line with six homers and 16 doubles in 210 plate appearances. He just hits. It is exceedingly rare to see an undersized teenager flash such immediate power in rookie ball, which created a great deal of hype around what Javier might do in full-season leagues. We've had to wait a bit to find out, but that excitement hasn't wavered in spite of the delay. MLB.com didn't rank Javier in its Top 100 but did name him Minnesota's best prospect to miss the list. Well, everything. Javier initially showed the skills that compelled Minnesota to commit all of its 2015 international bonus pool (and then some) to acquire him, but he spent last year rehabbing from major shoulder surgery instead of developing those skills. It shouldn't surprise, or alarm, anyone if Javier comes out of the gates slow this season. He has missed out on a full year of facing live competition at a time where those reps are so vitally important. Kirilloff showed us how quickly a young player can get back up to speed but Javier isn't nearly the same natural hitting talent. There was already a rawness to Javier's game and now that element is magnified. He'll see better pitching than ever before and will face a more demanding regimen than ever before. Amidst this setting, he needs to fine-tune and advance his game, while also acclimating to a surgically repaired shoulder leading his swing. Javier is in for a big challenge. But all evidence suggests he's up to it. A bulked-up Javier – who claims to now have 200 lbs on his 6'1" frame, according to Reusse's piece – will almost certainly start out in extended spring training as he works back into playing shape. But by May or June he should make his way to Cedar Rapids, where we'll finally get the chance to see what he can do. It's unfair to bring up Kirilloff's name and precedent in comparison. Expectations should be kept in check with Javier, for all the reasons listed in the section above. But the bottom line is that talent wins out, and on that front – well, I think Baseball Prospectus fantasy writer Darius Austin put it best when answering a chat question via Dusty from Colorado (infamous for his relentless inquiries about Javier) in December: "There is no upside for the player with infinite talent." Playing to the bit with hyperbole? Sure. But Javier's raw ability and athleticism are immense, and since we haven't yet seen them play out substantively on the pro stage, his possibilities feel almost limitless. There's no Twins prospect I'm more excited to follow in 2019. If you are very excited to follow him this year, does that mean you have wanderlust? Let's hope for healthy pursuit of his ceiling. Would love to wander over to Cedar Rapids to see this kid play this summer. The more of these reports I see and the less I am impressed with our farm. All of these guys thus far and good chance the rest have more ifs in their games than certains. The whats left to work ons are majors. So if Javier starts out in EST for awhile, who starts the season at SS for the Kernels? Probably Michael Davis, the Texas Tech product? Javier has pretty much the highest ceiling of any hitter as far as prospects in the Twins' organization go, and good to see him ranked this high here. I wander how many more of these puns we will see. I've got my own personal list of 10-20 prospects who make up my "guys I am keeping my eyes on the most". Naturally that includes Lewis and Khirilloff and others listed here. But I'm not so sure Javier isn't #1 on my list. All that talent and upside, and coming back from missing the season, could be a great story. Can't wait to see what he does this year! Excited to see his bat over a full season! If the hit tool is as good as everyone says, he will be right up there with Lewis a year from now. Not on my list.I just do not get these lists.Are they hope lists?Because I constantly question high ratings when someone has not played.I have been reading and reading about him on TD, but I hope we have much more.When a person misses time like he did I would put him in the second ten.I see the top ten as those I expect to see in MLB, the second ten in the, if things go right stage. But that is just me. Keep writing, I am learning. Looking at that picture above confirms he is no longer the skinny kid we remember from two years ago.Please, please stay healthy and give us the chance to enjoy what this kid can bring to the organization. When talking about ceilings, his is as high as any in the organization.What is the probability of his reaching it is the question.Lets think about the possibility he could be the player who will force Lewis to move off the shortstop position.Like all of us, I have no idea how likely that is, but it could happen. Seth (4), Nick (4), Tom (7), Cody (6). No question. Davis only spent about 6 weeks in Cedar Rapids, so that's' where he''s starting either way. It's just a matter of how much SS he plays. He has a very high ceiling, so here's hoping he can get off to a good start in Cedar Rapids and push his way to Ft. Myers this year. Missing time alone shouldn't drastically alter a player's overall future outlook. Yes, I slid Javier down a few spots, but that was mainly because I'm a little more risk averse than the rest of the guys and I feel really good about the floor of the six players I put above Javier. But if someone wanted to make the case for Javier at No. 1, I wouldn't think it was completely outrageous. He has a better chance of being an above average shortstop than Lewis does. Javier has continued to move up the rankings the last few years all while playing a total of 50 games (none above Rookie ball) in the last three seasons. With that said, I tend to agree with you that there is a good chance that he is a top 50 prospect at this time next year if his 50 games played transfer over this year. But I don't see how that justifies this years ranking. It might explain the in-ability for the Twins FO to make trades for established major league players, because outside of the top 3 prospects there doesn't seem to be any real for sure major league starters. All fair points, no doubt. But each year, or each time a ranking is done, it has to be on its own merit. I would also say this... in my opinion, the prospects from about 4 to about 12 or so are all pretty interchangeable... I think that speaks to the depth of the system as some of them have very high ceilings (like Javier) and others are close to ready (Gonsalves, Gordon, Littell, etc). The conversation is the best part!